A couple are torn apart when their teenage children disappear in the Australian outback. Strangerland does have two undoubted assets - a quality central cast and a striking location. Kidman, Weaving and Fiennes do their best to flesh out their characters, but there's not a lot for them to work with beyond the stereotypes of horny wife, grizzled cop and uptight husband. In recent years we've seen the central hook of Twin Peaks - teenage girl's disappearance or murder leads to the uncovering of smalltown and familial secrets - mined by a growing number of movies and TV shows. There was the Danish crime series The Killing and its US remake, the latter further aping David Lynch's show with its Washington state setting. Last year's Marshland took the same concept to rural Spain. Now, for her feature debut, director Kim Farrant gives us a sweaty Australian take on this increasingly clichéd archetype. The troublesome teen in question here is Lily (Maddison Brown), the 15-year-old daughter of Catherine (Nicole Kidman) and Matthew Parker (Joseph Fiennes). The Parkers uprooted to a small town on the edge of the outback after Lilly's affair with one of her teachers was exposed. Both Lily and her kid brother Tommy are none too pleased with the upheaval, and one night they up and vanish into the darkened outback, prompting a search led by local cop Rae (Hugo Weaving). Screenwriters Michael Kinirons and Fiona Seres fail to develop things much further after that point. The film plays its cards all too early regarding the central family's situation, and the few key revelations are offered through dialogue exchanges rather than a flashback structure which might have kept us intrigued for the entirety of the narrative. As is, we're left scratching our heads as to which sub-plots and characters we're supposed to be engaged with, and they all simply fizzle out without reward. Strangerland does have two undoubted assets - a quality central cast and a striking location. Kidman, Weaving and Fiennes do their best to flesh out their characters, but there's not a lot for them to work with beyond the stereotypes of horny wife, grizzled cop and uptight husband. The various montages of the outback, coupled with a barely developed subplot involving an aboriginal grandmother, suggest a half-baked attempt to flirt with the sort of antipodean mysticism found in Aussie New Wave classics like Picnic at Hanging Rock and Long Weekend, but this amounts to nothing. 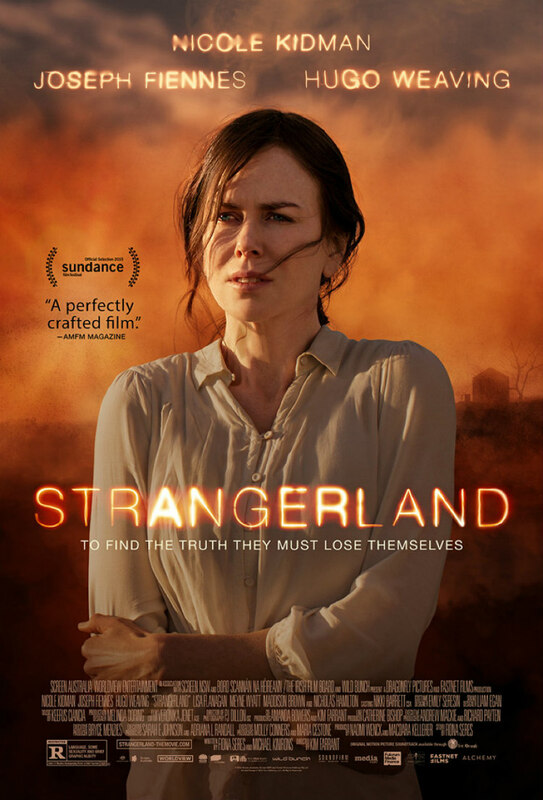 Farrant teases her talent, showing enough promise to suggest she may deliver something worthwhile with a more fully rounded script, but while the setting and performances just about hold our attention throughout, ultimately Strangerland is a shadow in the red dust of its predecessors.